Here we are at book three, and it's do or die for Amy and Elder - literally. They need to make a life for themselves and the residents of Godspeed on this strange planet full of "monsters" or basically give themselves to the stars. At 360+ pages, you know their life on Centauri-Earth isn't going to be so easy. With the introduction of a new planet - plenty happens in this story! 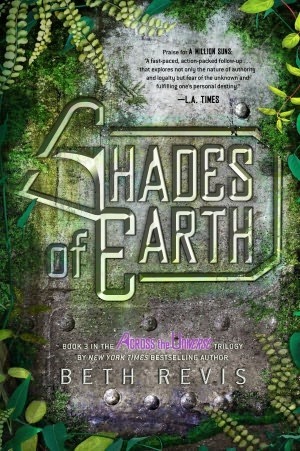 New plant life, animals, terrain, Revis paints an almost terrifyingly beautiful planet full of extraordinary things. We want to touch them (but not smell - inside joke) and get an up close look at this planet with two suns. When I wasn't in awe by all of the new stuff, I was wrapped up in Amy and her parents relationship. SPOILER Yep, her parents are unfrozen. While I was thinking this would be a little more climatic, I was thrilled they arrived in the story early on. Amy's parents are an interesting lot. They both dive head first into the mission that brought them on Godspeed in the first place. They are full of orders and commands and I'm not even sure they were happy to have Amy there. This isn't a complaint - I feel we are supposed to understand how much the two wanted to work and fulfill their mission on Centauri-Earth. Still, I felt a little sorry for Amy. She worried sick for months about being without them and when they showed up they were immediately caught up in their work. And just a little FYI, Amy's parents don't exactly fall in love with Elder and aren't too thrilled that she is a in a relationship with a young man who crash landed at the new place. I loved the tension between her parents, Amy, and Elder! Very entertaining! Zillions of teens can identify with the parent and boyfriend/girlfriend triangle. So, these monsters....that is the mystery of book three. Who/what are they? These monsters start picking off the Earthlings and Speeders (what I call the residents formerly on Godspeed) one by one. Mysterious deaths abound! Amy and Elder look again to the Plague Eldest for answers. BUT WAIT, the answers are probably back on Godspeed. Dun dun dunnnnnn. Answers are also on Centauri-Earth, in a hidden book, and with a mysterious boy named Chris. When Chris is introduced I just about had a conniption I was sweating bullets thinking he and Amy would share something together. Bullets, I tell you! Without giving another spoiler away - keep your eye on that kid from the get-go. In the end, there aren't as many people standing as the beginning, and we see some major characters go through some really hard times, but in the end no one is alone. Shades is a fantastic end to an amazing series! I'll miss Godspeed, the hilarious description of the Seasons, and most of all Amy and Elder. If you haven't read Across the Universe, it's never too late!